TagItSmart! - A Smart Tags driven service platform for enabling ecosystems of connected objects. - Participations open for AffectUs Hackathon on IoT Challenge@HUA, 2018Click here for detailed Info. 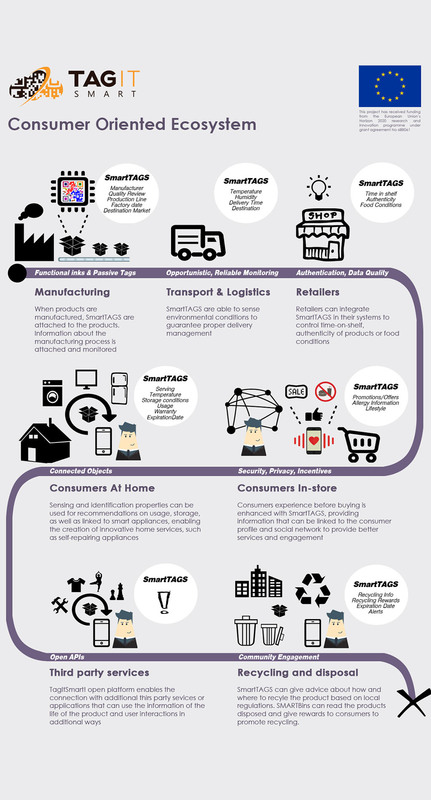 - INFOGRAPHIC: What happens from preproduction to recycling in TagItSmart with use-case DIGITAL_BEER. IoT is about connecting objects, things, devices, billions of them. In addition to smart phones, TVs, cameras, the usual examples of such connected objects are cars, homes, fridges, coffee machines, kettles, glasses etc. While it is possible to convert a kettle or similar products into a connected kettle, such products are is still not widely available mainly due to the cost of such setups. The goal is to connect What is still out of reach due to technological limitations and the cost of deployment are mass-market products: a carton of milk, a package of steak, a basket of apples, a book, a CD etc. Today, these products are identified by printed tags (barcodes, QR codes). These codes relate to the product they tag, not to the unique unit/object that holds the tag. Once attached to an object, tags are usually static and the information they provide does not change, regardless of the state or events happening in the immediate environment of that product. Our main emphasis is leveraging the feature of functional codes to dynamically change according to the context changes of each tagged product together with wide availability of smart phones that can capture/record/transmit these codes we can create context sensors for mass-market products and convert mass-market products into connected mass-market products with unique identity. IoT is about connecting objects, things, devices, billions of them.